Meme Logic: The tyranny of the tip. The tyranny of the tip. Do you give tips, why, and is it a good thing? Like everyone else I like eating out but I've always wondered why I had to tip at the end of the meal. Why don't I give a tip to the cashier at the store when he helps me fill my bag, why not to my hairdresser when she patiently listens to my stories, why not to my publisher when he recommends a good book why not the postman when she brings me a heavy package on the 4th floor without lift, why not to the bus driver when he kindly waited for I rushed in before closing the doors? 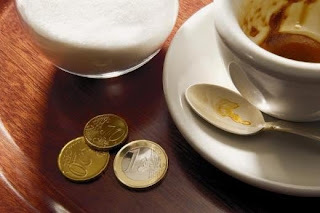 Tipping is a cultural trait linked to a very specific area of our culture, hotels and catering, and we are entitled to ask the reason for its existence and its relevance. From a memetic point of view, we ask the question: what are the mechanisms that led to the tipping culture to develop in certain services and not in others? Also we will reflect on how we can make them evolve. Here I will suggest a couple of possible leads, far from being exhaustive. I do not know the details but one can easily imagine how some customers satisfied with a service but sad to see a young person with a bad salary would be tempted to give a coin or two by simple charity. This financial incentive, from the point of view of the "servant" (the one that offers a service), will encourage him to renew his efforts to provide good service to other customers. In parallel, the word will spread that you are a generous customer, as a result you will get a preferential treatment, which will encourage other customers to give, not by charity but by a desire to receive special treatment. A complex set of behaviours may ensue. The "servants" can inform each other of which customers are likely to tip. Customers can attract “good servants” by showing their "generosity" in public, and formalizing the gesture of giving a tip. In addition, a customer may wish to broadcast a generous image of himself of a wealthy individual, among other clients. Thus, we observe that the tip can provide a mutual benefit for the client and servant. In hotels and catering services that are traditionally expensive, wealthy clients do not suffer from giving a little money and the less fortunate servants will be happy to significantly expand their revenues. In effects, the gain in tips may become much more important than the basic wage. Everything looks for the best, but the system can slip. That which can be seen as a simple exchange of services can become a harsh necessity. Indeed, the owners of restaurants and hotels will eventually realise the interest of the tips and would like to enjoy it too. Thus, bosses will begin claiming a share of the gratuities, or collecting it from employees or even reducing their salaries. As a result, the "servants" must ensure that they receive regular tips because their salary becomes insufficient. Tips are becoming a necessity for employees, which plays against them. There is another perverse effect in the system which this time works against the customer. When the servants always expect a tip, they will be disappointed not to receive one and no tip will become synonymous to poor service. Thus, a customer is expected to tip just for a normal regular service, with no special treatment at all. This creates a hidden cost to the customer. In the end, the winner in this story is the boss and the losers are the customers and employees. What at first might have been an act of charity from the customer to the employee becomes an act of extortion of the client and abuse of the employee. The customer ends up paying hidden expenses and the employee is found underpaid and forced to beg. Now let's ask the question of why the tips are mainly in hotels and restaurants and rare in other services. We quickly notice that there are certain areas where tipping is completely illegal. Imagine giving a tip to a police officer, judge or politician! These cases are therefore protected by law. But why not, for example, give a tip to a shop employee who gives you advice on which product to buy? The point I want to make here is the link between tipping and the psychological state in which customers are. When you go shopping for daily necessities you do not necessarily have great fun doing it. You focus on the fact that the job needs to be done as quickly as possible and as cheaply as possible. With this mindset, you're not inclined to be generous. In comparison, when you are eating, your psychological state at the end of the meal will be very different, especially if you have consumed some alcohol. Similarly, when you take a hotel room for your holiday, your mind is relaxed and playful, much more inclined to be generous. So I suggest that the mental state of clients will decide strongly their propensity to give tips. In a stressful environment tips will not succeed but in a relaxed environment they are more likely to spread. Can the perverse effects of tipping be reversed? For these effects to be reversed, there must be a direct benefit to a change of strategy. For customers, there is a social problem. When you dine with friends at the restaurant, you do not want your friends to think you are "stingy" by not giving a tip. You do not want to risk insulting the server or take the risk of being served incorrectly. From the perspective of the “servant”, it is clear that refusing a tip seems absurd. From the perspective of the boss, giving up on tips mean that he must pay his employees more money and raise his prices to compensate, which would drive away customers and would be a commercial suicide. We can clearly see how getting out of the tipping culture is difficult. Tipping is indeed a stable cultural system. One solution might be, for some, to advertise something like "No tipping here, paid employees." Who knows, it might work and attract a certain clientèle. Another more radical option would be a solution outside the system, ie a change in the law, for example by making tipping illegal and forcing employers to pay full wages. An alternative, perhaps more realistic, is to change the format of the service. For example, we see more and more self-service restaurant such as McDonalds, Starbucks, motorway restaurants, etc.. This format discourages the development of the tip simply because the clients help themselves. If you have some comments, I'd love to hear them. "Like everyone else I like eating out ..."
You should not assume this. I hate eating out and try to avoid it as much as I can. I hate the noise, the feeling of being trapped, the necessity of choosing the food and then waiting an unknown length of time for it to come. Of course on the rare occasions I have to eat out I do tip for the reasons you give, but I find it stressful having to think about how much. I was a waitress once and I hated it then for different reasons - partly the low wages but also the pressure it puts on you to be nice to people instead of just doing your job as well as you can for the satisfaction that might give you. I found myself tempted to be specially nice to rich-looking groups and that's creepy. I really enjoyed this blog. I have concluded that only a nation-wide law could get of this pernicious meme, but I hope I'm wrong. Will the no-tip tradition survive in Japan now do you think? Oh how wonderful it would be to get rid of it. Keep updating. I am looking forward to more posts. I don't know about the situation is Switzerland or France, but here in London most Black Taxi drivers seem to expect a tip, on top of their already extravagant metered fares. Taxi drivers are their own bosses, so I'm not sure how this fits in with the 'master/servant' relationship. Don't forget that in many parts of the world a form of tip (baksheesh) is still paid to expedite service from officials such as police or judiciary. In developed countries we would call that a bribe, and would balk at paying such a tip. I'm sure the tips demanded by officials would not be so trivial, and that might be one of the reasons why baksheesh doesn't occur as much in places with more developed legal systems such as Western Europe. Anyway, interesting post and I look forward to more! To TIP is a medieval custom from England that grew out of coach houses. As the horses were being changed patrons would stop off for some light refreshment. A TIP box was available 'To Insure Promptness' so that visitors could expediate their meals and be on their way sooner. It's amazing how cusoms take hold and evolve over time. Interesting blog and view. Just a quick thank you to everyone for your valuable comments ! I am very glad you enjoyed this article.